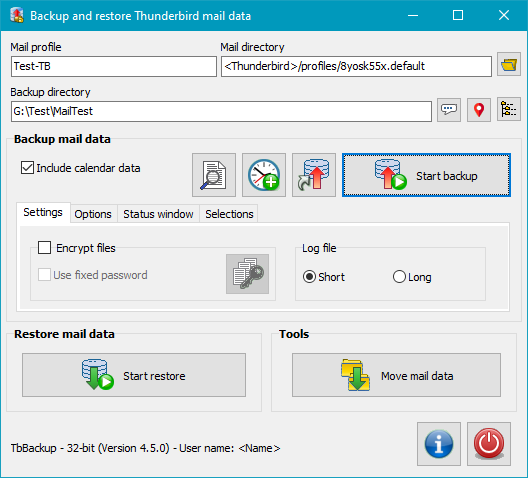 This program will help the less experienced Thunderbird user to backup and restore his/her mail data. It is part of the Personal Backup program package. Because the location of the mail data is a rather confusing and by default not visible to the user, problems can occasionally arise. In particular, a restore of mail data frequently fails. Using the TbBackup program provided, backing up and restoring of Thunderbird user data becomes child's play. After selecting the directory to which the data is to be saved, just a single click is required. Further settings are unnecessary since these are taken care of by the program. Subdirectories containing Thunderbird's temporary files must not be backed up and are automatically excluded from backup. The actual backup or restore is performed in the background by Personal Backup. If present, multiple Thunderbird profiles (more information). are supported. In such cases the desired profile must be selected prior to starting the backup. Important note: The program can only be used if all mail data is located at the original location or was moved by the user manually in conjunction with an adjustment of the file profiles.ini (see this description). If you instead changed the paths of the mail folders in the account settings of Thunderbird, TbBackup can not be used. In this case the Backup must be performed using a task in Personal Backup. The same applies to a Restore. If Thunderbird is being used with multiple profiles, the user must select the profile to be backed up, whereas a single profile (the most common case) will be found and selected automatically. If Thunderbird is being used with multiple profiles, the desired profile can be selected by clicking this button. Otherwise the profile of the default user will always be used automatically. The backup directory should preferably be located on an external drive. Click the button to select a directory. By clicking this button, the backup will be started. For this purpose, a Personal Backup task with all required settings will be created and started automatically. A progress window will be displayed on the screen. If the option Include calendar data is selected (default setting), all events and tasks from the Thunderbird calendar Lightning will be included in the backup. Create a desktop shortcut: A new shortcut for starting the mail backup will be created on the desktop. Double-clicking this icon will immediately run the backup. Automatic backup using the Windows Task Scheduler: Clicking this button will create a new task in the Windows Task Scheduler to backup your mail data. The task name will be generated automatically using the name of the mail profile for later identification. The other settings are similar to those for general backups (see more). If the task has already been registered, clicking this button will either run the task immediately or will open a dialog to change the settings. Show backup log file: Clicking this button will display the log of the last mail backup. Encryption: If the checkbox is marked, all files will be encrypted during backup using the AES method (more information). It is possible to specify a fixed password for the encryption. This will be stored as an encrypted string in the task file. For even higher security, you should not use this option but specify that the password must be entered manually for each backup. Log file: You can select whether you wish a short or a long log to be written during backup (more information). Synchronize backup directory: all files that do not exist (or no longer exist) at the source will be deleted from the backup directory. Use Recycle Bin: During synchronization, files will not be irrecoverably deleted but moved to the Windows Recycle Bin so that you can recover them if needed. This option is only available if the destination is on a local fixed drive. Send mail after backup: If you wish, you can send a backup report by mail to one or more recipients. Optionally the log file can be added as attachment. (more information). You can adjust if and how the status (progress and result) during backup will be displayed. There are the same choices as for automatic backups. If one of the options is selected that will close the status window automatically, additionally the waiting time can be set. If your mail data was backed up using TbBackup as described above, a Restore is very easy, because all information required to restore the selected profile will have been stored together with the backup. The user will only be prompted for confirmation before Personal Backup is started to perform the Restore (more information). If the mail data was backed up using a conventional Personal Backup task or by simply by copying the files, the information about the mail profile mentioned above will not be available. However, a Restore of the selected profile can still be performed but in this case the backup directory of the profile must be selected manually, whereupon the program will check that the selected directory is a valid backup of Thunderbird data. Before starting a Restore, the user can choose to delete all current mail files (even those not backed up). This is useful when for example indexing issues are present in the mail directory. When Thunderbird is next started, all required files will automatically be rewritten. Before starting a Restore, the program will check that the mail directory to be restored is assigned to the selected profile and actually exist. Usually the remedy for this is to install Thunderbird anew before trying Restore again. A running Thunderbird application must be closed prior to a Restore. If not already done, the user will be prompted to do this. By default all Thunderbird mail data is located within the user's Application Data. This is an area of the file system that is usually not visible to the user in Windows Explorer. In my opinion, this choice is less than optimal and a directory within the user's Documents would be more appropriate. Users who share this view can move all the mail data assigned to the selected profile to another location by clicking this button. The Thunderbird settings will be adjusted automatically. Important: before undertaking this action, backing up the mail data is strongly recommended. Usually this area is hidden to the user. To make it visible, change the Windows Explorer setting via Tools ⇒ Folder Options ⇒ View ⇒ Show hidden files and folders. However, this is not necessary for backups made using TbBackup. In the directory mentioned above you will find a profiles.ini file in which the assignments of the mail directories to the Thunderbird profiles are saved (more information). TbBackup will read the profile information from this file. If there are several profiles specified, the user must select the one whose data he wants to backup. A single profile (usually named default) will be used automatically. TbBackup will create a file bu-profiles.ini in the destination directory that contains the required information for restores. TbBackup uses Personal Backup for backup and restore. It will automatically create a backup task for each selected mail profile called tb-<profilename>.buj (e.g. tb-default.buj) with all required settings. The backup will allways use the method Backup into separate files with zip compression. Note that only those files that contain user settings and actual mail data will be selected. There are many files created by Thunderbird only for administrative purposes that do not need be backed up. Thunderbird will recreate these files automatically if necessary. You can open this task in Personal Backup to make additional settings and to start the backup directly from there. The same applies to a restore. In this case TbBackup will create a restore task called tb-<profilename>.rsj (e.g. tb-default.rsj) to be executed by Personal Backup.